Tennant Company (NYSE: TNC), a world leader in designing, manufacturing and marketing of solutions to reinvent how the world cleans, today announced a new agreement with Walmart. 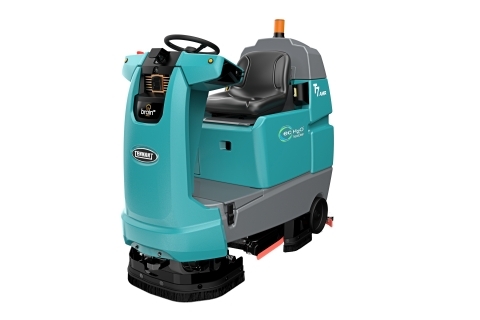 Tennant will provide Walmart the capability to improve the productivity and efficiency of their cleaning program by providing the T7AMR (Autonomous Mobile Robot)autonomous floor cleaners—equipped with Brain Corp.’s self-driving operating system, BrainOS®. Tennant Company’s support of Walmart’s broad deployment of Tennant robotic cleaning equipment represents a significant step toward the adoption of autonomous cleaning equipment in the marketplace. Want to learn more about the robotics revolution in the cleaning industry? Read about the growth of robotics today and what cleaning robots can do for business. Founded in 1870, Tennant Company (TNC), headquartered in Minneapolis, Minnesota, is a world leader in designing, manufacturing and marketing solutions that empower customers to achieve quality cleaning performance, reduce their environmental impact and help create a cleaner, safer, healthier world. Its products include equipment for maintaining surfaces in industrial, commercial and outdoor environments; detergent-free and other sustainable cleaning technologies; cleaning tools and supplies; and coatings for protecting, repairing and upgrading surfaces. Tennant's global field service network is the most extensive in the industry. Tennant Company had sales of $1.12 billion in 2018 and has approximately 4,300 employees. Tennant has manufacturing operations throughout the world and sells products directly in 15 countries and through distributors in more than 100 countries. For more information, visit www.tennantco.com and www.ipcworldwide.com. The Tennant Company logo and other trademarks designated with the symbol “®” are trademarks of Tennant Company registered in the United States and/or other countries.